“Reboot” is quickly on its way to becoming a dirty word among film lovers, and for good reason. The past year alone has brought us remakes of Point Break, Jumanji, Ben-Hur, The Magnificent Seven, The Jungle Book, and too many others to list. A quick search will yield you lists upon lists of beloved (and not so beloved) films that are getting the reboot treatment, for better or worse. Last year I wrote an article exploring the question “Are There any Original Ideas in Hollywood Anymore?” and as time has gone on it seems more and more like the answer is no. 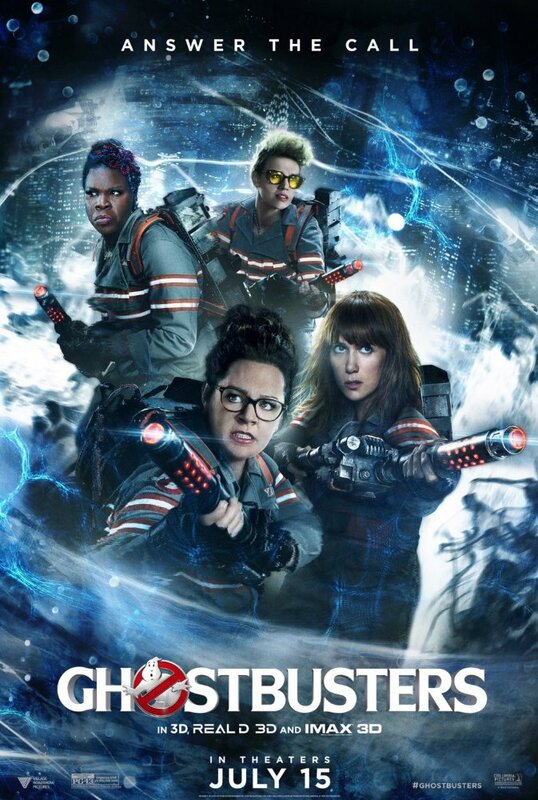 One recent reboot that’s been getting a ton of attention is the new, all-female Ghostbusters. Since the announcement in 2014 that an all-female Ghostbusters was to be made, the film has been polarizing. There are people who are outraged that the lead foursome is female, that the film is being rebooted at all, and is shot almost entirely in Boston instead of New York, which is where the film is supposed to be set. On the other hand, there are many who are cheering the female cast, and are happy that writer/director Paul Feig is breathing new life into an old franchise. Even once the film came out people were unsure of how to respond to it, as is illustrated on Rotten Tomatoes. The film has a 72% rating from critics, but audiences were more split, giving it a 55% rating. Leading up to the time that I finally saw it I tried to ignore the hype, both good and bad. I wouldn’t call the original Ghostbusters films timeless classics; they are decent films that have attained cult status over the years. And they aren’t on my list of favorite films, yet I still end up watching them almost every time they’re on TV. But I have an apprehension when it comes to reboots these days, whether I loved the original films they’re based on or not. Too many of my favorites have been destroyed for me to trust anyone’s “reimagining” of certain films. I applauded the idea of an all-female ghost fighting team, but that alone wouldn’t make the film a good one. Until now. There have been plenty of roles that Wiig has had over the years that are downright ridiculous, such as those in MacGruber, Semi-Pro, and the Despicable Me films, but I’d thought those types of limited roles were over for her. While a wacky film at times, I feel like Wiig had proven herself capable of roles with more depth and range starting with Bridesmaids. Yes, the character of Annie in that film was flawed and hilarious, but Wiig portrayed her in a way that made you feel for her, and the struggles she was going through nonetheless. Since Bridesmaids Wiig has had roles in Welcome to Me, Hateship Loveship, Girl Most Likely, The Secret Life of Walter Mitty, The Skeleton Twins and The Martian, all of which showcase the talent, skill and dimension she has. Given her roles in the films I just mentioned, I feel that Wiig’s performance in Ghostbusters is a major step down that she shouldn’t have taken, and I truly hope it doesn’t hurt her career-wise. Overall there are so many things about this rebooted Ghostbusters that I didn’t like that I hardly know where to begin. I guess I’ll start with the story itself. According to an interview in the New York Daily News, writer/director Paul Feig had this to say, “I live or die on what things are funny and whether or not people will be entertained by them. [My goal is] to tell a story you haven't seen before. Or tell a story you've seen before, but in a way you haven't seen it." He accomplished half of those goals with this film. He told the story in a way we’d not seen before, but it was far from funny and entertaining. With a film like this it’s impossible not to make comparisons to the original, and I’ve got a few to mention. To start, the film’s title is Ghostbusters, and that is what the foursome call their fledgling company in the original. In the latest version though, they call their company Ghost Corps, which seems out there, if not like a slap in the face to the diehard fans out there. In the original film, the secretary Janine is played by Annie Potts. She is smart and witty and doesn’t take abuse from anyone, certainly not the four men she works with. In the 2016 version, the women hire Kevin, played by Chris Hemsworth. Kevin is the epitome of the stereotypical dumb blonde secretary, historically played by women through the years, but has even less sense than that. He seems to be nothing but a boy toy for the women, since he can’t seem to handle even the simplest of tasks, such as answering the phone. This character is an insult to both men and women, and seems to affirm the idea that it’s perfectly ok for women to objectify men, so long as it doesn’t happen the other way around. The last comparison to the original film I’ll make (as there are so many I could easily go on and on and on…) is with the number of ghosts actually encountered during both movies. (For the sake of this comparison I’m counting the ends of both films, when hordes of ghosts take over the city, as a single ghostly encounter). In the original film there are at least half a dozen encounters during which the Ghostbusters bust, or attempt to bust, various ghosts throughout the film, before the hordes at the end. All of this works to keep the original Ghostbusters film exciting and entertaining to watch. In contrast, I kept a mental tally while watching the new Ghostbusters film, and only counted five ghostly encounters including the horde at the end. I know that without watching both films again and keeping a more stringent tally, my numbers may be off by one or two; but in a film whose title has the word ghost in it I certainly expected there to be more ghostly action over the course of the almost two hour run time. Here’s what all of this boils down to: I applaud Paul Feig’s efforts to make a film female inclusive and diverse, but that effort falls too far short on the back of what is an extremely weak story. And although my opinion of this film is in the minority among female filmmakers and critics, it is in line with the studio’s thoughts on the film. Prior to its release, Rory Bruer, president of worldwide distribution at Sony said to The Hollywood Reporter that, “While nothing has been officially announced yet, there's no doubt in my mind [sequels] will happen.” But after failing to reach the film’s break-even box office totals of $300 million worldwide, there has been no other mention of sequels, which is a good thing. This rebooted version of Ghostbusters can’t hold a candle to the original, and would be better off buried in a landfill somewhere never to be seen again, as happened with the 1982 video game E.T. the Extra Terrestrial. Ghostbusters is rated pg-13, was written and directed by Paul Feig and stars Kristen Wiig, Melissa McCarthy, Kate McKinnon and Leslie Jones. It’s available now on Blu Ray, DVD and digital download, but if given the choice avoid it and see the original again instead!